We could solve problems around your oven. 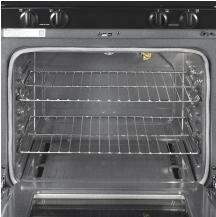 Generally, a problem of oven could come from one among many of causes and hard to know where it derives from. Therefore, without experience, knowledge, and support device, it is difficult to know from where the problem is. Warning: Like dryer, oven works at high current (30Amps/220_240Volts). It is dangerous without knowledge, experience to "play" with it.